Reactee has mashed-up it’s services with Twitter to create a great hybrid of two services that I already like independently. 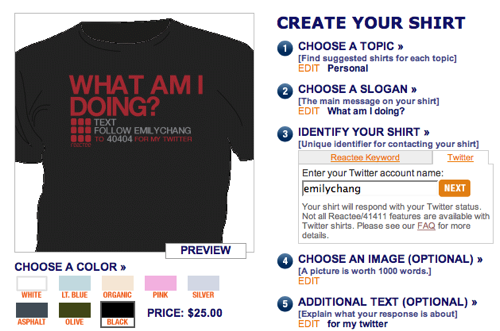 Reactee has created an easy way to make your own t-shirts customized with your Twitter username. I’ve already made mine (http://reactee.com/emilychang) and purchased one. You can get your Twitter Reactee here. eHub did an interview and a review of Reactee last month as well. I love this kinda thing. Reminds me of skim.com which I had high hopes for. They had a six digit number that was unique to you (and your clothes) with an email where people could email you. Of course, this was all 1.0 and almost ten years ago. Chris, I was really into skim.com back then too! It was an idea before its time, or at least before email and SMS became so popular. I was sure they were going to rock the rave scene (at least), I wanted to contact them about bringing skim to Montreal at the time but I think they just fizzed out. They really inspired me to further explore all the fun stuff and ideas that preceded Bluetooth, Shotcode, and others. I was ecstatic when I discovered skim, I’m so sad they they faded away. On a related note, with all he hubbub around “local”, mobile advertising… I know some people from Profilium(.com, the site still lives) and they had it going on over 5 years ago… Around the same time there was ad-supported free cell phone carrier here in Montreal called Espion that couldn’t stay alive long enough to reach a critical mass. It’s a shame to see all these innovative companies, stick their necks out too early just to get their heads chopped off.